The book opens with a small passage from the time when the Trade Federation was attacking Naboo and Sabé was impersonating the queen. It’s a nice way to start as there’s a really good line that sets the stage, “Sabé turned to face her enemies as the Queen of Naboo, and Padmé all but disappeared into her shadow.” From there, Padmé and her handmaidens are having some fun relaxing on Naboo. However, the way chapter one kicks off is interesting as it’s mirrored at the end of the book with Padmé’s ultimate fate. It’s serves as the bookends of the story, from happiness in life, to peace in death. The book goes over the election on Naboo for a new queen, them selecting a new senator to represent their planet in the Republic now that Palpatine is Chancellor, and several issues in the government that Padmé ends up dealing with, particular a crisis on an agricultural world. Along side Padmé, we also get a lot of exploration of Sabé. Of all of the handmaidens, she gets the most focus, and the book ends in such a way that we could very well see more of her in the future. Keep in mind Sabé was played by Keira Knightley in the movies, and her character did not die (that was Cordé and Versé who died in the explosion in Attack of the Clones). 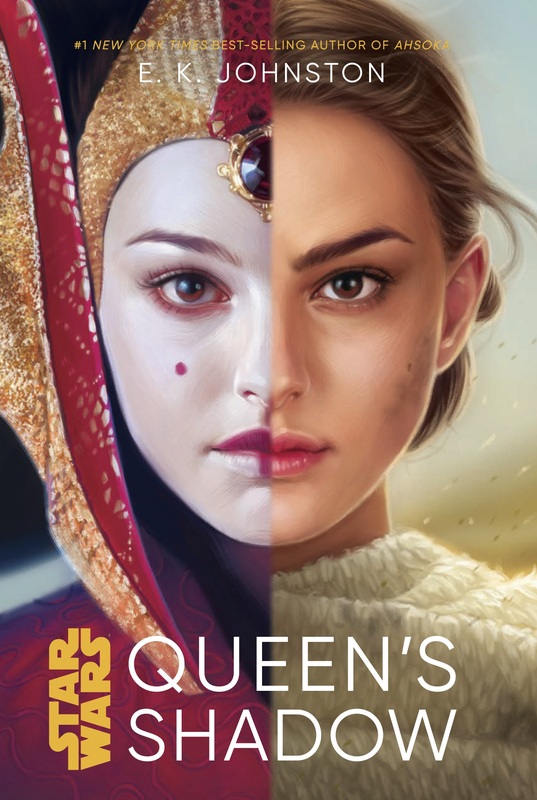 By focusing on these two characters, the book pulls back the veil on who Padmé is, who the handmaidens are, what their role is, what Amidala is, and how the whole Naboo queen thing works. It answers a lot of questions and adds a lot of depth to the characters. Some of the more interesting areas the book explores is slavery and politics. Padmé feels guilty about leaving Anakin’s mom behind on Tatooine in a life of slavery, and she feels the need to do something about it. While she doesn’t succeed in this book, it’s interesting that that idea is there and it’s one of the things she wanted to accomplish that she was never able to. Through the story, Sabé goes looking for Shmi on Tatooine and tries to do something about the slavery problem there. Her journey there reveals how difficult the issue really is. Once they hit a dead end, the focus turns back to politics as Padmé navigates the life of being a senator. We get to see other senators, like Clovis and Mina Bonterri who showed up in Star Wars: The Clone Wars, as well as the big names like Bail Organa and Mon Mothma. We see the first introductions between them and Padmé and how bonds are formed. We also get to see Padmé’s frustration with how helpless the senate seems. The book actually has a couple endings. On one hand it ends with Nute Gunray’s trial and him being let off with no charges and him also placing a bounty on Padme’s head. This will ultimately lead to the attack on Padmé’s life at the beginning of Attack of the Clones. It’s kind of an abrupt ending with Padmé asking her people “What do we do next?” On one hand, we can see this continue through the films and the animated show, but on the other hand, there’s room for another book to continue this story. Yet there is an epilogue which provides another ending for the story. The epilogue jumps to Padmé’s funeral and Sabé trying to figure out what to do now that Padmé is no longer in her life. In this ending, it ends with Bail Organa reaching out to her, and yet another excellent place for another book to pick up. Imagine Sabé getting to meet Leia and telling her what her mom was like? Who knows if we’ll ever get that, but as is, the ending in this book certainly opened up some possibilities. While Queen’s Shadow is a slower paced book of character exploration, it is an interesting read since it explores characters and a time span we knew little about. It adds greatly to the character of Padmé, which in turn adds to the greater story of Star Wars, the animated shows, and the films. The story also delves deeply into the world of the handmaidens, who they are, and what their roles are and how they shifted from supporting Padmé as Queen of Naboo to senator. As such, I give this book a four out of five metal bikinis. It’s definitely worth checking out.